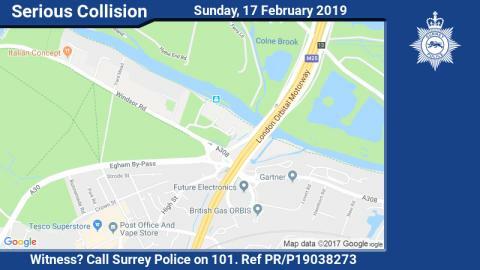 The collision, involving a silver Lexus, occurred around 4.05pm on the A308 Windsor Road at the junction with the Runnymede roundabout. One of the passengers was pronounced dead at the scene. The four other occupants in the car have been taken to hospital where they are receiving treatment for minor injuries. The road is currently closed while emergency services, including ambulance and fire crews, deal with the incident. Anyone who witnessed the incident, particularly anyone with dashcam footage who was driving along the road prior to the collision, is asked to contact us straightaway on 101, quoting incident reference PR/P19038273.